How does preeclampsia affect pregnancy? When does preeclampsia occur in a pregnancy? What can we do about preeclampsia? Preeclampsia (pre-e-CLAMP-si-a) is a condition unique to human pregnancy. It is diagnosed by the elevation of the expectant mother’s blood pressure usually after the 20th week of pregnancy. According to guidelines released by the American College of Obstetricians and Gynecologists, the diagnosis of preeclampsia no longer requires the detection of high levels of protein in the urine (proteinuria). Evidence shows organ problems with the kidneys and liver can occur without signs of protein, and that the amount of protein in the urine does not predict how severely the disease will progress. Prior to these new guidelines, most healthcare providers traditionally adhered to a rigid diagnosis of preeclampsia based on blood pressure and protein in the urine. Preeclampsia is now to be diagnosed by persistent high blood pressure that develops during pregnancy or the postpartum period that is associated with high levels of protein in the urine OR the new development of decreased blood platelets, trouble with the kidneys or liver, fluid in the lungs, or signs of brain trouble such as seizures and/or visual disturbances. Important symptoms that may suggest preeclampsia are headaches, abdominal pain, shortness of breath or burning behind the sternum, nausea and vomiting, confusion, heightened state of anxiety, and/or visual disturbances such as oversensitivity to light, blurred vision, or seeing flashing spots or auras. Preeclampsia and related hypertensive disorders of pregnancy impact 5-8% of all births in the United States. Most women with preeclampsia will deliver healthy babies and fully recover. However, some women will experience complications, several of which may be life-threatening to mother and/or baby. A woman’s condition can progress to severe preeclampsia very quickly. The rate of preeclampsia in the US has increased 25% in the last two decades and is a leading cause of maternal and infant illness and death. Preeclampsia and other hypertensive disorders of pregnancy can be devastating diseases, made worse by delays in diagnosis or management, seriously impacting or even killing both women and their babies before, during or after birth. You may encounter other names like toxemia, PET (pre-eclampsia/toxemia) and PIH (pregnancy induced hypertension) EPH gestosis (edema, proteinuria, hypertension), but these designations are all outdated terms and no longer used by medical experts. Gestational hypertension, blood pressure rising after the 20th week but not accompanied by proteinuria. Many factors guide a healthcare provider’s decision about how to manage preeclampsia, including the gestational age and health of the baby, overall health and age of the mother, and a careful assessment of how the disease is progressing. This includes monitoring blood pressure and assessing the results of laboratory tests that indicate the condition of the mother’s kidneys, liver, or the ability of her blood to clot. Other tests monitor how well the unborn baby is growing and/or if he or she seems in danger. When the pregnancy is less than 37 weeks the caregiver usually tries to gain some time, but if 37 weeks or later, the provider will often opt to deliver the baby. The healthcare provider will watch for signs of instability in the mother, including very high blood pressure that’s not responding to antihypertensive drugs, signs the kidneys and/or liver are failing, and a reduced number of red blood cells or platelets. Providers also watch closely for indications of an impending seizure or signs the brain is about stroke, and may treat the patient with magnesium sulfate (an anticonvulsant specifically used for preeclampsia). Antihypertensive drugs will be used if blood pressure rises to dangerously high levels, 160/110 or higher. Eclampsia (e-CLAMP-si-a) is a very serious complication of preeclampsia characterized by one or more seizures during pregnancy or in the post-partum period. In the developed world, eclampsia is rare and usually treatable if appropriate intervention is promptly sought. Left untreated, eclamptic seizures can result in coma, brain damage, and possibly maternal or infant death. Magnesium sulfate (given intravenously) is the treatment of choice for severe preeclampsia – to prevent eclampsia – or after eclampsia develops to prevent recurrence. Many, but not all, doctors will also treat every preeclamptic patient with magnesium sulfate during labor, even when the disease appears mild. Magnesium treatment is generally continued for 24-48 hours after the last seizure. You may receive magnesium sulfate in an intensive care unit or a labor and delivery unit. While magnesium is given you will be observed closely, receive intravenous fluids, and may have a catheter placed in your bladder to measure urine output. Magnesium sulfate can be used by a skilled healthcare provider with appropriate support facilities. Overdoses can occur, especially in the context of impaired kidney function. Magnesium sulfate has often been compared to Epsom salts, but ingesting Epsom salts, and magnesium vitamin supplements have not been shown to prevent maternal death due to eclamptic seizures. Levels achieved with oral therapy are not sufficient to prevent seizures. For more information about HELLP syndrome, read this special health information. Speak to your physician about your risks, and what you can do to minimize them, but recognize that no definitive answers to the cause or causes of preeclampsia yet exist. There are a number of theories about the initiating cause of preeclampsia and the descriptions in research articles can be difficult to understand. We’ve included in the chart below some current medical terms for the various theories and a layperson’s interpretation. A more detailed article about the potential causes is also available here. Angiogenesis Factors regulating the formation of new blood vessels in the placenta are overproduced which in turn affect the blood vessel health in the mother leading to hypertension and kidney damage. Prostacyclin / thromboxane imbalance (ASA) Disruption of the balance of hormones that maintain the diameter of the blood vessels. Endothelial activation and dysfunction Damage to the lining of the blood vessels that keeps fluid and protein inside the blood vessels, keeps blood from clotting, and regulates elasticity of the blood vessel. Calcium deficiency Calcium helps maintain blood vessels and normal blood pressure. A deficiency may lead to increased blood pressure. Injury to the blood vessels due to excessive blood flow or pressure. For example one might compare the condition to what would happen if a garden hose was hooked up to a fire hydrant. Preexisting maternal conditions The mother has undiagnosed high blood pressure or other preexisting problems such as diabetes, lupus, sickle cell disorder, hyperthyroidism, kidney disorder, etc. Immunological Activation The mother’s immune system mistakenly responds as if damage has occurred to the blood vessel and in trying to fix the "injury" actually makes the problem worse . Nutritional Deficiencies Insufficient protein, excessive protein, fish oil, vitamin D, and other diet factors . Obesity High body mass index (BMI) is linked to the genetic tendency for high blood pressure, diabetes and insulin resistance, and also to the effect of obesity on the inflammatory system . Genetic Tendency The hereditary transmission of inherited characteristics among family members . Preeclampsia is often silent, showing up unexpectedly during a routine blood pressure check and urine test. In cases like this, if the baby is considered “term” (on or after 37 weeks) and the growth rate considered normal, the baby is delivered, and the mother monitored and sent home as usual. The impact of preeclampsia is more profound if it occurs earlier in the pregnancy, or in a woman who had high blood pressure before pregnancy. Care providers may recommend time off work, bed rest, medication and even hospitalization to keep the blood pressure under control. Keeping the baby in-utero as long as possible, assuming growth continues, is preferred for the long-term health of the baby. Unfortunately, the only "cure" for the disease begins with delivery of the baby and placenta, which is sometimes recommended before the pregnancy goes to term in the best interest of the mother. Doctors may prescribe anti-hypertensive medications. If the blood pressure cannot be managed with medication and treatment, and the mother's and/or baby’s health is at risk, the mother may be given steroids to aid the maturation of the infant's lungs prior to delivering the baby. Preeclampsia can appear at any time during pregnancy, delivery and up to six weeks post-partum, though it most frequently occurs in the final trimester and resolves within 48 hours of delivery. Preeclampsia can develop gradually, or come on quite suddenly, even flaring up in a matter of hours, though the signs and symptoms may have gone undetected for weeks or months. In some instances, preeclampsia does not appear until during the delivery, or the 48 hours that follow, but it has been known to occur up to six weeks post-partum. While obviously not dangerous for the baby, post-partum preeclampsia is still critical for the mother. Sleep deprivation, post-partum depression, more attention on the newborn, and a lack of familiarity with normal post-partum experiences all contribute to more easily ignoring or missing indicators of a problem. Any of the signs and symptoms described above should be cause for concern, and you should immediately contact your health care provider if you experience any of them. Click here for more information on postpartum preeclampsia. A baby is considered premature if he or she is born before 37 weeks, but more severe issues occur when a baby is born earlier than 32 weeks. Babies born later than 32 weeks in developing countries may have more severe problems than babies born in high resource countries since those countries often lack the resources that preemies need. The effects of being born early can vary widely. Some babies may spend only a day or two under close observations while others may spend the first months of their life in the Neonatal Intensive Care Unit (NICU). Some babies may also have lifelong problems such as learning disorders, cerebral palsy, epilepsy, blindness, and deafness. Having a premature baby can also mean a great deal of emotional and financial stress for a family. Preeclampsia can cause reduced blood flow to the mother's placenta, restricting the supply of food to her baby. As a result, the baby may become malnourished and be small for its gestational age. Ultrasounds can help identify IUGR. Many babies who suffer from IUGR can catch up on their growth within a few months, although recent research suggests that growth restricted infants are more prone to adult diseases including diabetes, congestive heart failure and hypertension. Of the 30 million IUGR infants born worldwide each year, 15% (4.5 million) are associated with preeclampsia. Mother’s shouldn’t blame themselves or poor nutrition for IUGR, because it is caused by a failing placenta and not the mother’s diet. You could be eating all of the right things, but if the placenta is not capable of passing nutrients along, your baby’s growth will suffer. The baby survives in the womb by receiving nutrients and oxygen through the placenta. Preeclampsia compromises the placenta and the baby’s body begins to restrict blood flow to its limbs, kidney and stomach in an effort to preserve the vital supply to the brain and heart. Should the baby’s oxygen reserve become depleted, (as the placenta detaches or dies) the baby’s body may produce too much lactic acid. If too much lactic acid builds up, the baby will develop “acidosis” and become unconscious and stop moving. Delivery is essential at this point, even if the baby is premature. Infant death is one of the most devastating consequences of preeclampsia. In the U.S., approximately 10,500 babies die from preeclampsia each year and an estimated half a million worldwide. Many countries do not have the means to keep a premature baby alive, so the rate of neonatal death in these countries is therefore much higher. Stillbirths from preeclampsia (babies that die in utero after 20 weeks of gestation) number between 1,000 and 2,200 in the U.S. Stillbirths are much more likely to occur with severe preeclampsia, HELLP syndrome or preeclampsia superimposed on chronic hypertension. Preeclampsia can appear and progress very quickly. Please err on the side of caution and contact your doctor or midwife immediately if you experience warning signs of preeclampsia. An integrated system of maternal and newborn care can reduce some of these deaths. This includes diagnosing preeclampsia early, monitoring the baby’s condition, using magnesium sulfate to prevent maternal seizures and possibly confer neurological protection on the baby, administering steroids for the baby's lung development, safely managing early delivery when needed, and providing specialized care for pre-term newborns. However, we ultimately need more research. We need to find a cure. Preeclampsia has been linked to a host of lifelong challenges for infants born prematurely, among them learning disorders, cerebral palsy, epilepsy, blindness and deafness. With prematurity also comes the risk of extended hospitalization, small gestational size and the interruption of valuable bonding time for families. Prematurity stresses a family unit, and this stress is compounded when the mother is also ill.
An integrated system of maternal and newborn care can reduce some of these deaths. This includes diagnosing preeclampsia early, monitors the baby’s condition, using magnesium sulfate to prevent maternal seizures and possibly confer neurological protection on the baby, safely managing early delivery when needed, and providing needed care for pre-term newborns. However, we ultimately need more research. We need to find a cure. Currently, the only “cure” for preeclampsia begins with delivery of the baby and placenta. When preeclampsia develops, the mother and her baby are monitored carefully. There are medications and treatments that may prolong the pregnancy, which can increase the baby's chances of health and survival. Once the course of preeclampsia has begun, it cannot be reversed and the health of the mother must be constantly weighed against the health of the baby. In some cases, the baby must be delivered immediately, regardless of gestational age, to save the mother's or baby's life. We say the cure begins with delivery because women are still at risk for preeclampsia and other hypertensive disorders of pregnancy, after delivery. It is imperative that postpartum mothers continue to monitor their health for at least six weeks after delivery. Find out more www.stillatrisk.org. Right now, early diagnosis through simple screening measures and good prenatal care can predict or delay many adverse maternal outcomes of preeclampsia. Prompt treatment saves lives. Research is beginning to provide insight into some of the molecular abnormalities present in preeclamptic women and it is hoped that these recent discoveries may lead to development of a cure. Researchers suggest there are probably several different variables, some maybe genetic in origin, that predispose a woman to getting preeclampsia and that a preventive or curative therapy for one woman may not work for all women. Although the Preeclampsia Foundation helps fund research, much more is needed. Sadly, preeclampsia is still one of the lowest funded research areas in terms of what health economists call Disability Adjusted Lost Years (DALYs), and we think the pregnant woman deserves a better deal. Policymakers, scientific investigators, health care professionals and patients need to work together to bring the information we already have to those who need it most and to drive greater awareness and resources to this devastating problem. 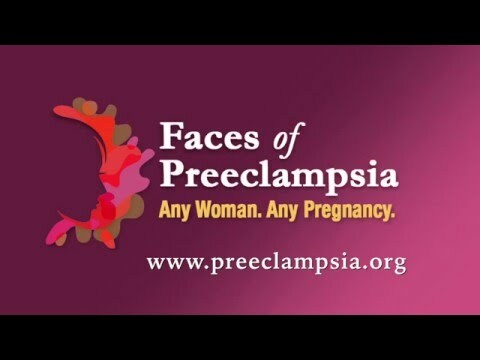 The Preeclampsia Foundation has launched a grassroots campaign to secure support for bipartisan legislation titled the Preventing Maternal Deaths Act of 2017, H.R.1318, and the Maternal Health Accountability Act of 2017, S.1112. We need your support. Click here to join the movement. To contribute to our research and education programs, please make a contribution here or call us to discuss your interests in giving. Research suggests the risk of having preeclampsia again is approximately 20%, however experts cite a range from 5-80% depending on when you had it in a prior pregnancy and how severe it was. More research is needed to know more certainly how high your risk is. The risk of preeclampsia increases if you have these risk factors; if you've developed chronic hypertension or diabetes since your previous pregnancy; or if you are having IVF, twin, or other multiples. Your doctor may also decide to start you on low-dose aspirin before getting pregnant or during the first trimester of your pregnancy. Taking aspirin does not guarantee that you will not develop preeclampsia. It is simply one more thing that women can do with relative safety to reduce their overall risk. If your current healthcare provider has advised against getting pregnant again, you may wish to seek a second opinion and weigh your options. Sometimes a doctor will advise against a future pregnancy to err on the side of caution for your safety and well-being. But even a well-meaning obstetrician may not have the experience to provide this advice. We advise all women in this position to seek a pre-pregnancy consultation with a maternal-fetal medicine doctor who specializes in preeclampsia and related disorders. They can review your medical history, evaluate potential underlying disorders, and give you a more clear idea of your risks. It’s important to remember, however, that preeclampsia is life-threatening and a specialist’s counsel to not get pregnant again should be taken seriously. Some of our experts have weighed in on this topic in our Ask the Experts section of this website. What is the long-term impact of preeclampsia? This research does not mean you will definitely develop heart problems if you had preeclampsia, but for some women pregnancy can serve as an early warning sign for future heart disease. This kind of “heads up” gives you an opportunity to make changes now for a healthier tomorrow – and reap the benefits today, too! Read more here. Some studies suggest, babies born from preeclamptic pregnancies have a higher risk of developing hypertension, coronary artery disease, and other chronic illnesses in adult life. These risks are especially true among babies who were delivered at term. **Didn’t find the answer you were Seeking?? Ask a support question here.